Let’s be clear that the unfinished American Indian Cultural Center and Museum in Oklahoma expresses two gigantic negative symbols in the state that will be remembered for years. First, it symbolizes the continuation of racial abuse by government officials of indigenous people here and elsewhere that really begins with the western European colonization of what became the United States. People will accuse me of hyperbole, but it’s difficult to imagine an unfinished oil baron museum in Oklahoma or an unfinished “settlers” museum, isn’t it? 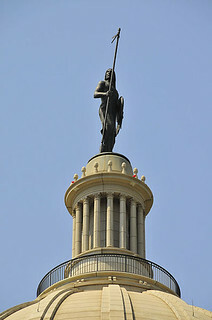 Second, it symbolizes the failure of state government-and in particular Republicans here-to govern effectively. Finishing the AICCM has been an issue for the last several years at the state Capitol, but lawmakers have failed to act. Construction stopped on the project in 2012. The state needs to come up with $40 million that will be matched by private donations. It hasn’t done so. It’s the Republican-dominated government that has failed on this issue. I weigh in on the issue once more because the state’s two largest newspapers published editorials about the issue this week. The Tulsa World is adamant. “For some time,” the newspaper snorts in pompous and unidentified journalistic “we” language, “we have maintained that the state should not spend another penny on the cultural center, especially not in bond debt.” (We, we, we, all the way to wrong as you can get.) There’s not a lot of ambiguity here, folks. I guess we must allow for the Tulsa and Oklahoma City rivalry here, and the unfinished AICCM IS in Oklahoma City. But the editorial fails to note the importance of the center and its relationship to native people here. Instead, it bellows: “We urge the Legislature to use what money is available for what really matters – schools, roads, public safety and mental health . . .” Of course these things matter greatly, but so does the AICCM, which is directly related to schools and education. Imagine all the field trips, the research, the scholarly activity and the critical inquiry that will be created by the AICCM. Of course, the newspaper’s support for the project seems more rooted in financial development in Oklahoma City than the loftier goal of providing an extremely small sliver of reparations for native people, who endured removal from their homes and lands under the genocidal President Andrew Jackson in the nineteenth century. He’s still on the twenty-dollar bill, one of our nation’s most common currencies. Ever get $100 out of an ATM? One plan is for Oklahoma City, which gave the state the land for the project, to take it over and try to finish it. Perhaps, it could get wrapped up in another MAPS project. At this point, if state lawmakers don’t provide the additional funding, it might be the last-ditch plan. Right now, the state pays $6 million a year to maintain the AICCM and pay its debt service from a previous bond issue. It’s remarkable to me that Republicans are just throwing away this money while calling for government fiscal responsibility. I realize the state faces a budget shortfall, as The Oklahoman noted, but this is a major museum built to Smithsonian standards that will draw people here from around the world. It seems obvious that it will eventually pay for itself. It’s an investment. But this is about way more than money, which the state’s two largest newspapers fail to note in any adequate manner. It’s about a major part of the state’s history because, as we know, President Jackson moved many Indian people from the south right here to Oklahoma, at least those that could survive the Trail of Tears. It’s time to finish this project.